I love a good festival and they usually crop up in my Japan itinerary somewhere. During the winter the big one everyone talks about is the Sapporo Snow Festival and with good reason, it is huge and fabulous and we had the most amazing time. As I’ve mentioned before it was my first experience with serious snow and I couldn’t have picked a better introduction to being cold and loving it. The thing is I also love getting out of the main centres and have a real passion for the less commercial, community based festivals. So of course when I heard a couple of references to snow and candles in a town called Otaru only 40 minutes from where we were staying in Sapporo we grabbed a few hours out of the afternoon and hopped a train to see if we could find the Otaru snow light path festival! Turns out it’s super easy and well worth the effort if you have a free evening. The JR train runs directly from Sapporo station to Otaru, you hop out on the small station and as you walk out the front of the station you find the first snow sculpture. On the day we went it was appropriately one of Japans much loved Shinkensen or Bullet trains. We headed directly down the main road from the train station to the canals and restored old warehouse buildings which is one of two main areas for the festival, this area is called Unga Kaijo. It doesn’t really get underway here until after dark, but it’s interesting to watch the locals cleaning up, making minor repairs and getting their candles ready. We decided to take an early dinner in one of the buildings down on the canal, there are a wide range of eateries here from high end to those serving very affordable steaming hot bowls of hearty ramen. The area is well known for it’s seafood and I like to try the local favourites so I chose a seafood hot pot style creation, It was absolutely delicious. 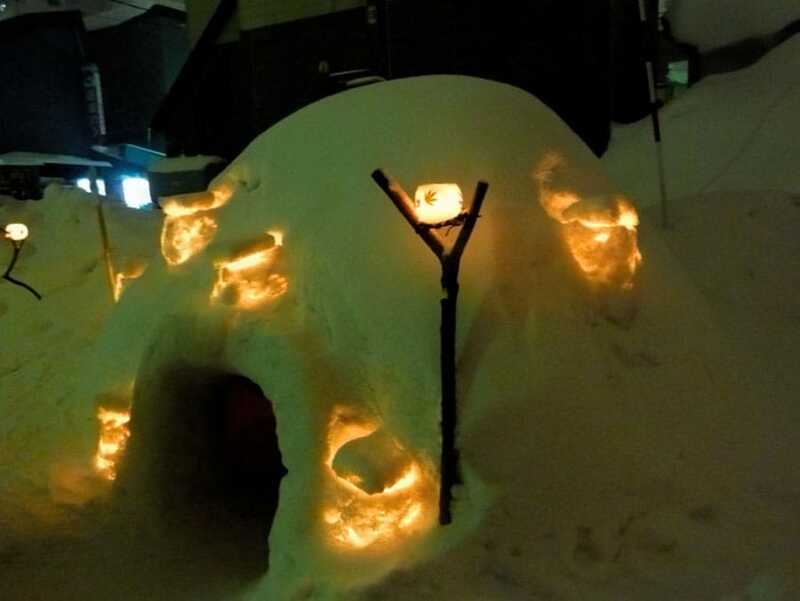 By the time we were done the canals floating lights were on and the canal frontage had been transformed by the soft glow of the candles in their snow holders. 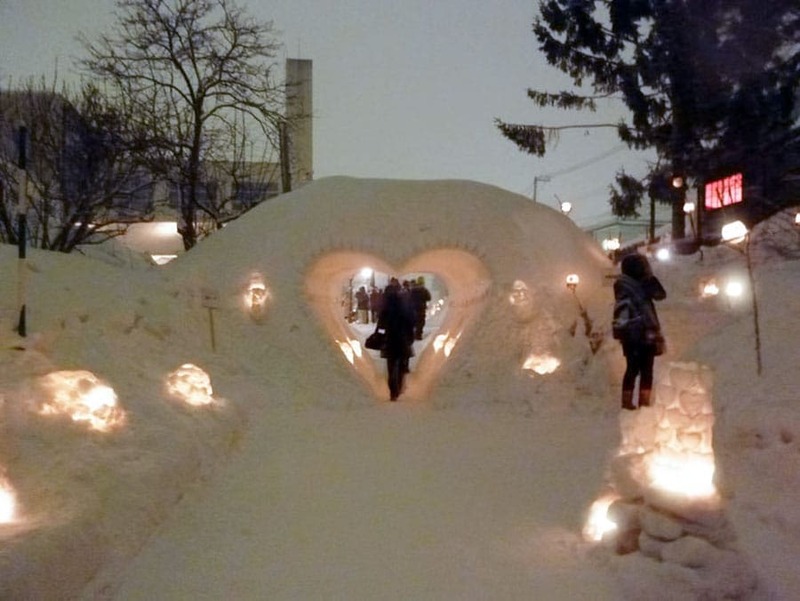 It was immediately clear why this was called the Otaru Snow Light Path festival or in Japanese Otaru Yuki Akari No Michi. When we’d finished exploring the canal area we headed back towards the station. Along here on your left is the second main festival area called Temiyasen Kaijo, it’s set up along the tracks of the abandoned Temiyasen railway line. This was the first place we saw the Japanese igloo called a kamakura. 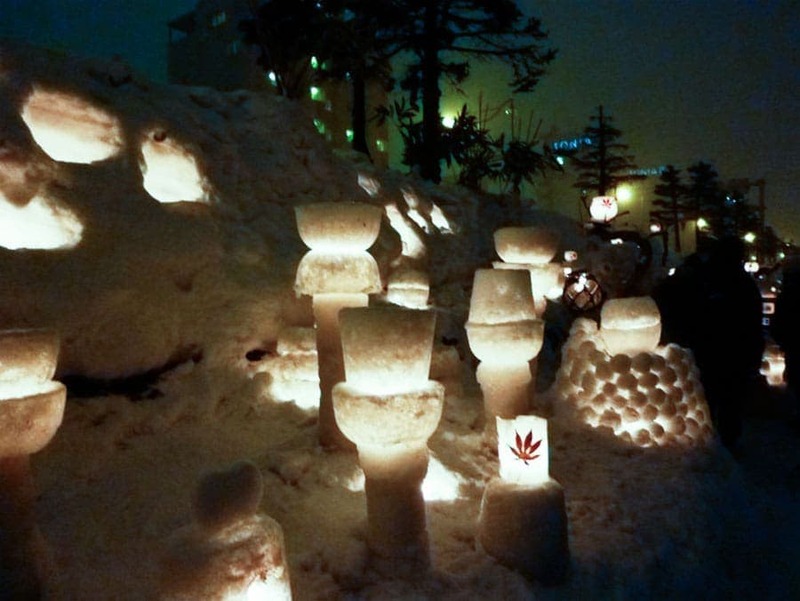 There are more snow sculptures, candles and a few yatai (food stalls) along here. The festival is held each evening for 10 days and coincides with the Sapporo snow festival so you can easily enjoy both during your stay in Hokkaido. It’s lit up between 5-9pm which is plenty of time to see the festival areas, have some dinner and take a slow walk back through the town where local shop keepers have created their own snow sculptures outside their stores. Even in the snow it’s only around a 15 minute walk from the railway station to the canals but if you aren’t used to snow and don’t have grippy snow boots then take your time and enjoy the scenery. I almost took an almighty skate striding too quickly on a crossing on the black ice. 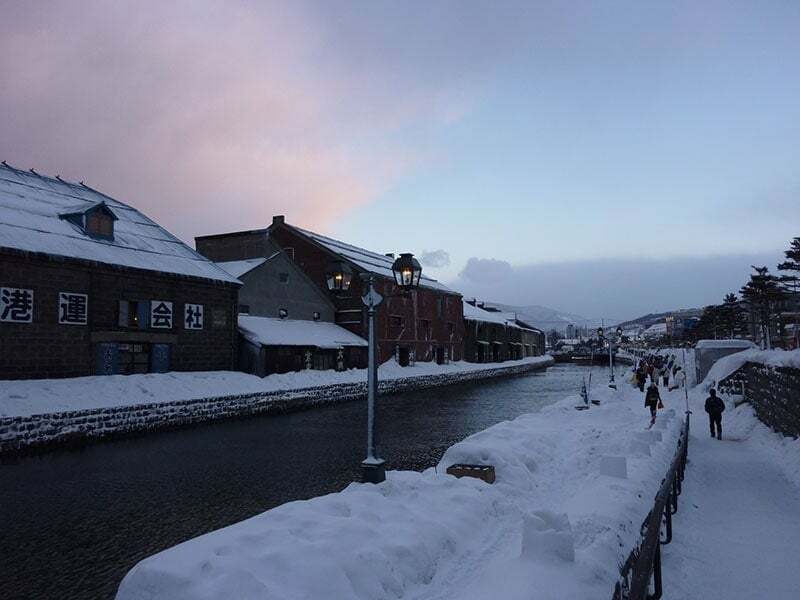 Getting from Sapporo to Otaru is easy, from the JR station take either the semi-rapid Ishikari liner or the Airport rapid, it will take between 30-40 minutes depending on the train and time of day and cost Y640 each way. Getting back you simply reverse the process and the trains run well into the evening so you can have dinner, enjoy the snow gleaming and not worry about missing that last train back. When you arrive at the station head down the main street directly in front of the station to the Unga Kaijo area. Heading back to the station the Temiyasen Kaijo area is off to your left just follow the snow candles, you won’t miss it. 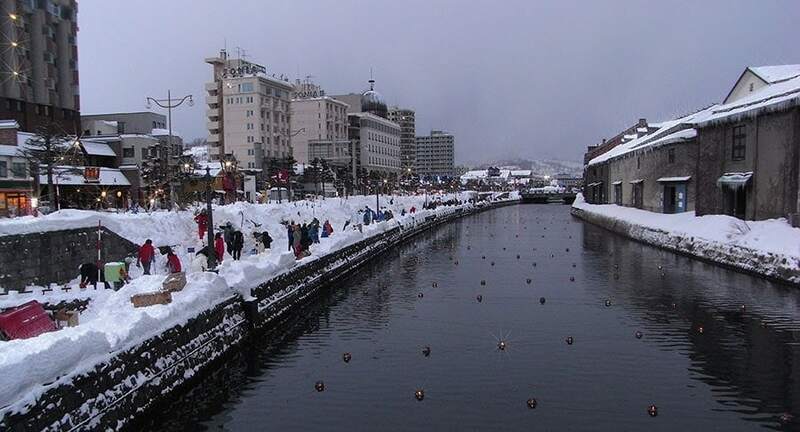 Have you been to the Otaru snow festival? Which do you usually gravitate to, the spectacular commercial events of the more intimate small town celebrations?